How does writing an adaptation compare to writing an original play? Most writers like to do an adaptation once a year as you know what happens next. The pain of doing original work is it's up to you to decide where the plot goes. With an adaptation, you just have to make the plot work in the context you've decided on, so in One Man, Two Guvnorsit's set in 1963, Brighton. Then all I have to worry about is making it funny. It's a great pleasure to do adaptations; I'm not saying it's easier, but it's more pleasurable because someone's already written the ending. Deciding how to end a play is a writer's torture. A Servant of Two Masters has a complex structure and is very much of its period. What are the problems in adapting and updating a work of this genre? The main problem to solve is that the plot revolves around arranged marriage and that doesn't exist in contemporary society, except within certain cultures. But we wanted to set the play in the 1960s so it would have been a very different play if I'd explored immigrant marriages in that decade. The solution we came up with was a marriage of convenience because one of the parties was gay and wanted to hide that fact by marrying a woman. That was my first big breakthrough. The second problem was the sword fighting that features in the original. I remembered Baz Luhrmann's film, Romeo + Juliet, where he got around his updating of Shakespeare's play by branding the automatic guns the characters used as being made by a manufacturer called 'Sword' so he didn't have to change the text's references to swords. This made me think that in the 1960s East End gangsters would have carried around flick knives and that introduced the gangster concept to the adaptation. You've relocated the play from 18th century Venice to 1960s Brighton. How did that come about? I remember having many early discussions with Nick [Hytner, the production's director] about where to set it. Because food is such a main motivating factor for the central character, my original idea was to set it just after WWII because food was still being rationed. I thought the kind of period music and clothes we could incorporate would be very stylish. But Nick wasn't very keen on that as he thought the colours [both literally in the set and costumes, and stylistically in terms of the mood of the music] would be too muted; browns and greys and military colours. Nick was set on having more primary colours in the mix so we settled on 1963. You've retained many elements of Commedia dell'arte. Was this important to you? I certainly wanted to keep most of the stock characters from the genre. Nick and I sat around a lot and talked about how those characters fitted into British comedy, music hall, Variety, even Monty Python; you can imagine John Cleese playing a pretentious middle-class gent spouting Latin [like the character of Harry Dangle in One Man, Two Guvnors]. We wanted to put a bit of a 1963 spin on the stock characters. So, for example, the birth of feminism gave us the character of Dolly. The physical stuff was quite a challenge and also it's not fashionable in contemporary theatre to have asides to the audience. The physical gags and business we're doing is a risk. I'm quite sure some of the more pretentious broadsheet critics will find it a bit too close to pantomime. But Nick and I wanted to make an accessible, popular comedy that would find a new audience for the NT. The first draft had quite a lot of swearing in it because that's how East End gangsters speak, but Nick felt very strongly that we should take all the swearing out so that family audiences could watch the show. There's only one use of the 'F-word' in the play now, right at the end. You've been sitting in on rehearsals quite a lot. How do you find handing over the play to a director and actors? I would normally only be in the room for the first week of rehearsals, but with this there's been a lot more work, partly because of how all the physical business that's being created affects the script. Nick has wanted me around much more than I usually am which I'm very happy to do, but usually I'm only too happy to get out of the way and let the director and actors get on with it. Nick and I have worked on three plays together now and my involvement really depends on the project. With England People Very Nice, our first collaboration, I was in the rehearsal room all the time because we wrote it as we rehearsed. We did a lot of rewriting on that and we've found a way of working together on rewrites whilst I'm in the room and he's directing. I don't consider any of my plays to be finished until the Friday of the first week of performances. I know the play will get better once it's in front of audiences and it's that performance draft I send to the publishers, not the first rehearsal draft. 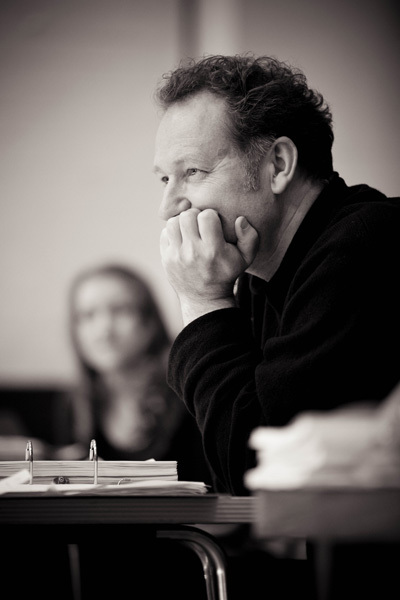 Interview by Adam Penford for the National Theatre education department.